'Bells Ring Out' is an outstanding collection of well-crafted songs to sing at Christmas, with a linking narrative to tell the Christmas story. There is a brightness about the whole piece that communicates itself to performers and audiences alike - your Christmas concert on a plate! There is a lovely variety of styles and moods, from gentle and lyrical to jazzy and energetic. 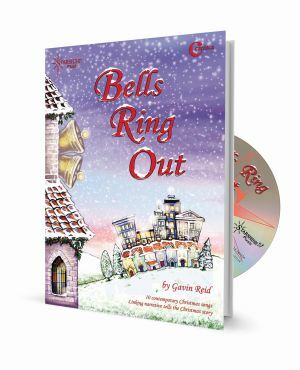 Although the songs may be sung in unison, there are very effective harmony parts that are easy to teach, making 'Bells Ring Out' ideal material for young choirs and a great choice for Christmas singing in general. "Bells Ring Out is brilliant! ...a wonderful, varied and memorable set of songs that the children thoroughly enjoyed learning. You could hear the toe-tapping, catchy melodies of 'The Donkey Song', 'All Over the Hillside' and 'Bells Ring Out' being sung in class, corridors, the playground and even the staff room! There were also a few tearful moments when the beautiful song 'Baby Jesus Sleeps' was sung. We will definitely be singing these songs again and I would highly recommend them for a school Carol Service." ~ Zoe Graham, Music Teacher, St, Elizabeth's Catholic Primary School, Richmond. Fantastic. A really lovely collection of songs which we are looking forwards to performing in the local Town Hall. Fabulous service from Starshine after we lost our book, scripts were emailed within minutes. Thank You so much. Cannot recommend you highly enough. I would like to thank you for the great Cantata 'Bells Ring Out'. We performed it today, the Morley House, Lewes Old Grammar School in our local church in Lewes, East Sussex. I thought thevocal range was excellent and the children thoroughly enjoyed the contrasting styles of songs. I will be looking out for more of your productions. Many thanks. Many thanks for such great arrangements! The music is so uplifting. I can't wait to try this out with my pupils in Ireland. I taught for many years in UK and wish I'd found this music sooner! 'Bells Ring out' is brilliant! The music is a wonderful, varied and memorable set of songs that the children thoroughly enjoyed learning. You could hear the toe-tapping, catchy melodies of 'The Donkey Song', 'All Over the Hillside' and 'Bells Ring Out' being sung in class, corridors, the playground and even the staff room! There were also a few tearful moments when the beautiful song 'Baby Jesus Sleeps' was sung. We will definitely be singing these songs again and I would highly recommend them for a school Carol Service. The audience of parents, friends and fellow pupils was entertained to a wonderful show. The performance was outstanding and the young performers received a standing ovation before singing an encore. Review by Eileen Speirs - Acting Head Teacher, East Ayrshire. Children So Obviously Enjoyed The Music. Review by Jeanette Verster - Music Teacher, New Zealand. We had our Carol Service at the end of last week during which one of our junior choirs sang 3 songs from 'Bells Ring Out'. The response from the audience was overwhelmingly positive, in fact, although the minister asked the congregation to refrain from applause because it was a service, the people just could not help but to applaud! I had several emails and phone calls from parents and teachers commenting on the fact that the children so obviously enjoyed the music. The children simply loved it and found it really easy to learn. They particularly enjoyed the many solo parts. Catchy and lilting songs which the children immediately responded to with 'Ye-e-s!' when I announced one of their particular favourites.